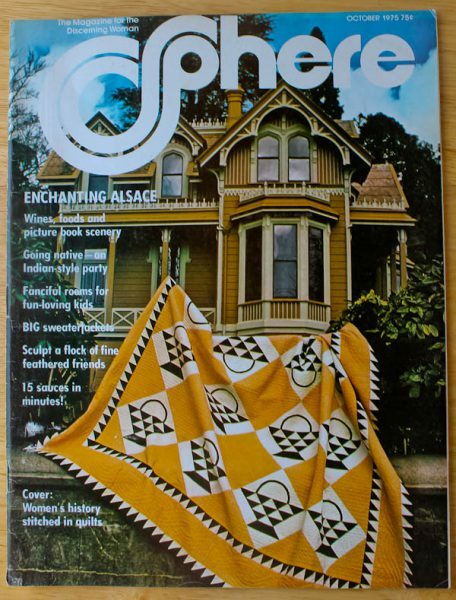 Vintage Sphere magazine from October 1975 offers ideas for fall clothes, crafts, entertaining, cooking, and baking. One article visits what was once the heartland of Charlemagne’s kingdom, the French province of Alsace. I wanted to make the Alsatian Onion Tart that sounds amazing, but no way would I even get my husband to take a bite. Too many onions for him. 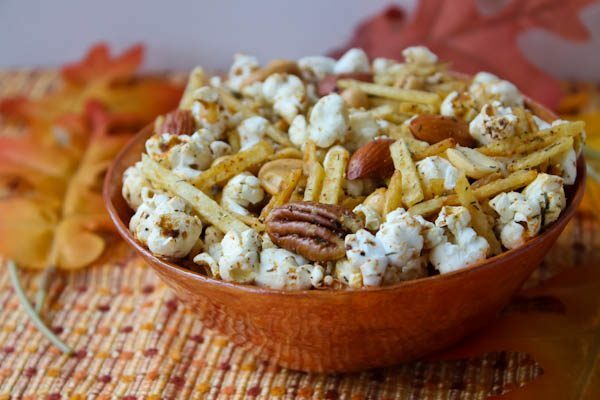 Instead I found a recipe for Harvest Popcorn, which sounded good for October, plus better than eating an excess of Halloween candy. 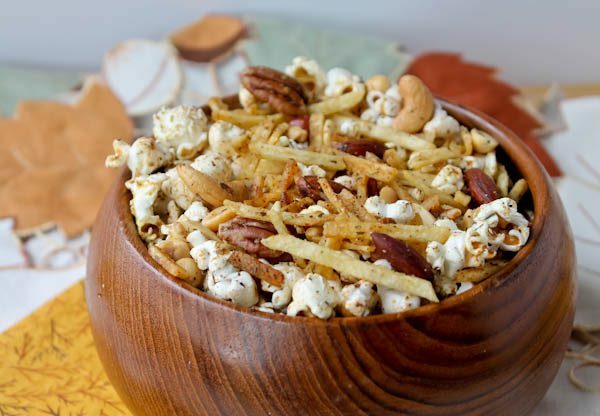 Popcorn, mixed nuts, and shoestring potatoes are drizzled with a savory butter mixture and baked. It’s wonderfully crunchy and would make a fun snack or appetizer for a party or to munch on during a game. It’s something a little different from the usual cereal mix. While the popcorn mixture was baking, I thumbed through the Alsace article again and still want to make that onion tart. I also want to make a Kougelhopf, which the article states is the pride of Alsace. The Alsatians find it ideal with morning coffee and is equally popular with afternoon tea. Marie Antoinette is said to have loved it. I have a kougelhopf pan so maybe you will see it in a future blog. In the meantime, here’s the popcorn recipe. And have a safe and fun Halloween. Mix butter, dillweed, lemon pepper, Worcestershire sauce, garlic powder, onion powder, and salt. Toss with remaining ingredients. 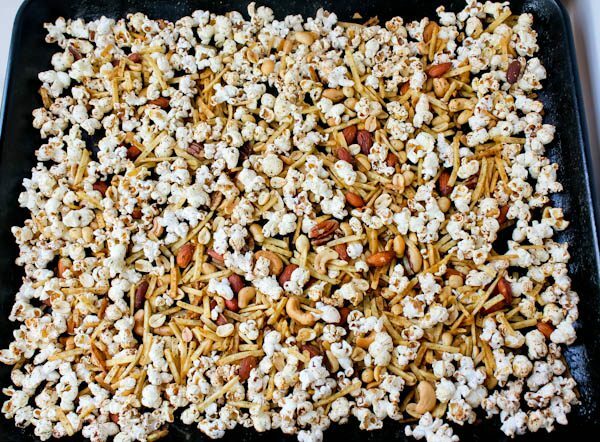 Spread popcorn mixture in a jelly roll pan and bake for 8 minutes, stirring once. Let cool in pan then store in airtight container. *Tip: ⅓ cup unpopped corn makes about 2-1/2 quarts popped corn. Thank you for sharing this recipe! It sounds really tasty! I printed it out! Looks like a yummy munchy mix! Thanks for the recipe, Debbie!!!! Sounds addicting! Have a spooktacular Halloween!